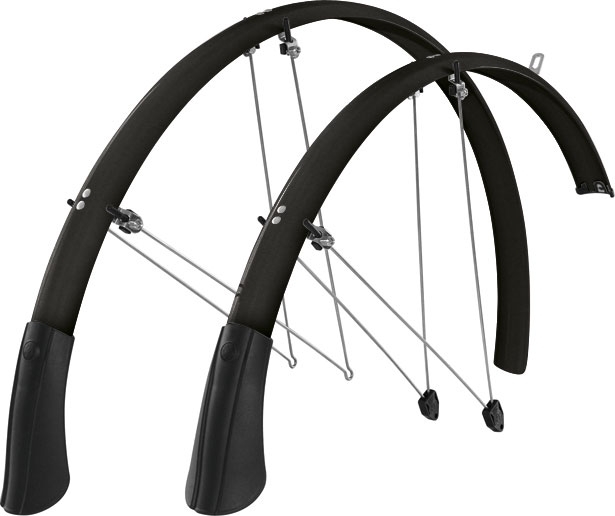 The SKS Chromoplastic mudguard set is a classic in dirt/spray protection. Rock solid and bomb proof--a match for the long term, perhaps overkill? These are on for life. They seem very solid and have so far kept their position and worked great. They have nice wide coverage and I can easily fit 30 or even 35 mm tires inside them. Could even do knobby cross tires if I had them. The rear fender is very long at the back, making it almost impossible to flip the bike up on its back wheel to maneuver it around in a tight space (e.g., my office). I don't think they need to be so long, i.e., there is no tangible benefit in terms of protection beyond a certain length. They are also a chunk of work to install. I am a good mechanic and it was not really a major problem, just took a longer time than others I have had with more adjustments and tuning needed. However once in place, I think they are set for life. Good solid, complicated design and implementation. Not for the quick mount or mechanically faint of heart. I may end up shortening the rear ones if I cannot find a better way to steer my bike around in close quarters. Outstanding fenders mounted on a New Albion Privateer with 700x37 touring tires. Plenty of clearance. Stable. No shaking or shimmying. Front fender required trimming due to Jandd front rack. Easy to trim with the finish trim piece concealing the cut edge. Nice deep bronze/black color looks black until you get up real close. Lost several of the rubber tips on a 550 mile trip. Recommend a small amount of adhesive or hair spray to hold them on.